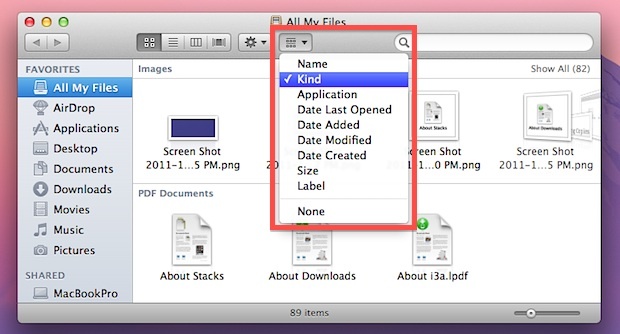 “All My Files” is the all-inclusive folder in Mac OS X that includes, well, all of your files. It’s basically a smart folder that lists every user owned or created file, and by default it’s sorted by the files kind: Images, PDF’s, Documents, Music, Movies, Developer, and so on. You’re not limited to sorting by filetype kind though, and by using the All My Files pulldown menu, you can choose to sort by name, last date opened, date added, date modified, date created, application the files were created in, size, and by label, or to have no sorting at all. These are other than the default setting of “Kind”, which is a very helpful way to sort a lot of personal files while avoiding the hierarchical folder structures that can develop in a traditional filesystem. You can change these settings options by toggling the available column headers, or by right-clicking within the column header to enable or disable additional grouping and sorting possibilities. If you don’t use “All My Files”, remember that you can set the New Window default to show the user Home directory again, which was the default behavior in Mac OS X 10.6 Snow Leopard. All My Files is the future of the Finder simplification model before removing it completely from the operating system. First, single place for all files with no folders or separation except by file type or origin application. Then, a move to the app-only access model a la iOS where there is no filesystem or Finder, only access of compatible files by compatible applications. Like it or not, that’s where we’re going folks. This is an almost fix from Apple and a bad one. What most people want is for their files to sort like Windows–sort by name, with folders getting priority at the top. With Apple’s sort by Kind as you can see within each KIND the “kinds” are not in alpha order. What a mess! This is disappointing and I wish Apple would give us this option. The types of arrangement are persistent. It means you can first order by NAME, then reorder by KIND, and you will get files ordered by type and sub-ordered by name. Now what really bothers me is the order by SIZE, because it creates size groups (“from 1GB to 10GB”, “from 500MB to 1GB”, and so on) instead of a single file-after-file order. So inside the groups they are not really size-ordered. That is one I still couldn’t figure out. anyone? Am I a dummy? I open All My Files and it comes up z-a order. BELIEVE me I’ve clicked all over kingdom-come to try to reverse it so it’s a-z. What am I missing? The whole window seems frozen, I can’t click on ANYTHING… Might it be my ‘mouse’ do you HAVE to have a ‘smart mouse? (wireless I guess…) to have the window recognize?… Eeech! Thanks for this! I’ve been going crazy because my All My Files view was set to arrange by Kind. Six weeks ago I added several hundred contacts to my address book and they took up the first few screenfuls of All My Files. Setting Arrange to Last Modified or Last Opened makes it much more useful—your top-of-mind files are top-of-the-list. « What is the Background Music in the iPhone 4S Commercials?